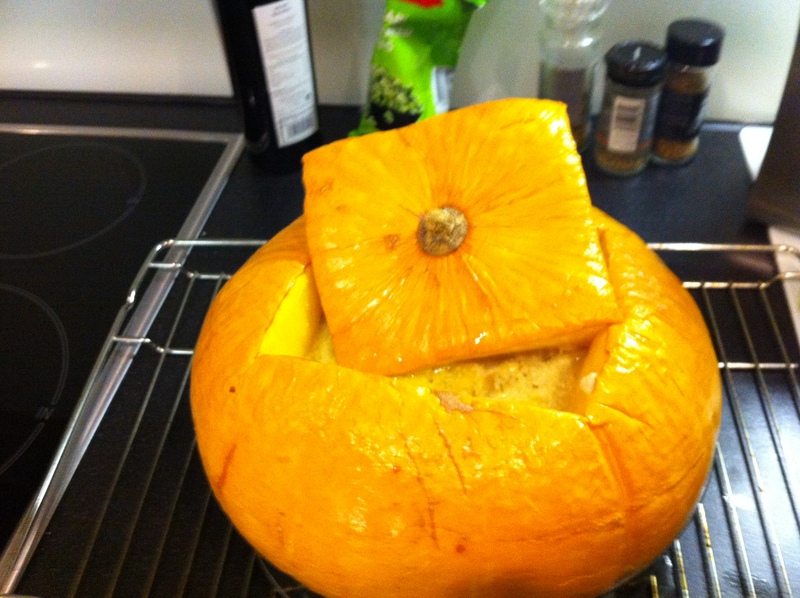 I remember my mum making pumpkin soup in the pumpkin itself when I was younger. So when I went to Alexis’ in Belgium and saw that his parents had pumpkins growing in their garden I took one straight back with us to London and gave it a try. Now I have to be honest with you and say that I fell asleep in front of the tv whilst it was in the oven so I’m not sure how long it should be in the oven. Mine was over-cooked as it was in there for too long, that is for 2h30mins so it probably should be in the oven for 1h30. Though check it throughout cooking time as it will also depend on the size of your pumpkin. Heat your oven to 200C. Cut the top of the pumpkin off and empty its seeds. With a spoon scrape out some of the pumpkin and put in a bowl. Slice your onions, garlic and fry in a pan until slightly golden and then add the pumpkin, continue to cook for a few minutes. In the pumkin add a bit of the onion mixture, add a bit of cream, herbs and a slice of bread and continue layering. You can add sliced bacon or anything else you want in your soup. At the end add about half a glass of water. Put the top back onto the pumpkin. Put the pumkin in a round cake tray as this will help it keep it structure. Place the pumpkin in the oven for 1 to 1 and a half hour . You can pick the top with a knife when it goes through the pumkin is cooked.